I am an educator and gaming enthusiast. A love of competition and teaching others has driven me to create this website. It has already gotten to a point with Call of Duty Modern Warfare 3 that people are starting to get fed up with quick-scoping. Not that they weren’t already pre-pissed off about the idea of one of the most over-hyped and sensationalized playstyles in the Call of Duty world (quick-scoping has been around since the game’s inception). For those of us that played Call of Duty 2 on the 360 (oh, the good ol’ days before leaderboards) sniping was the only real weapon to use. Why? Simply because it was one shot = one kill… and that was great, to a point. Now we are experiencing something in Modern Warfare games especially annoying. Quick-Scoping has taken the hearts and minds of silly teenagers all over the YouTube Universe. While I will be the first to admit that I find these videos of people quick-scoping to be kind of entertaining; I must also digress that it isn’t difficult to do (with a little bit of practice and the right ‘perk’ settings). Just Tell Me How To Do It! Okay! Fine, you want to know how to quick-scope? You first have to make changes to your Custom Sniper Class. This revolves around your ‘perks’ and will be focused on your weapon quickness rather than your character quickness. If you are looking this up and reading the article, chances a re good that you have seen the basic fundamentals in action. The real ‘trick’ to this silly strategy is using the AIM ASSIST. MW3, by default has aim-assist turned on. This means that if an enemy goes past your cross-hair it will automatically move (very slightly) towards that enemy. This is where these ‘pro’ snipers get their not so impressive help. Our next few videos are going to have a focus on some of the things that happen in Modern Warfare 3 and how to do them or avoid them at your own risk or peril. For you noobs out there, this site and YouTube Channel have been dedicated to you from day one. If you have questions, please comment on our entries here shoot us a tweet! Always here to help and we know you are reading! So, please do the manly thing and ask for some gaming direction. Remember when you played a game for a high score? Remember playing a game for the sake of having fun? It feels like years since people have talked and/or bragged about their single-player accomplishments in video games. Now we are stuck in some sort of bastardized version of gaming that has been essentially raped by money driven tournaments that have caused some to become obsessed with ‘going pro’. Is this the NBA? Sorry, but it is far from the NBA and anyone that wants to be a ‘pro’ gamer is far from an athlete. 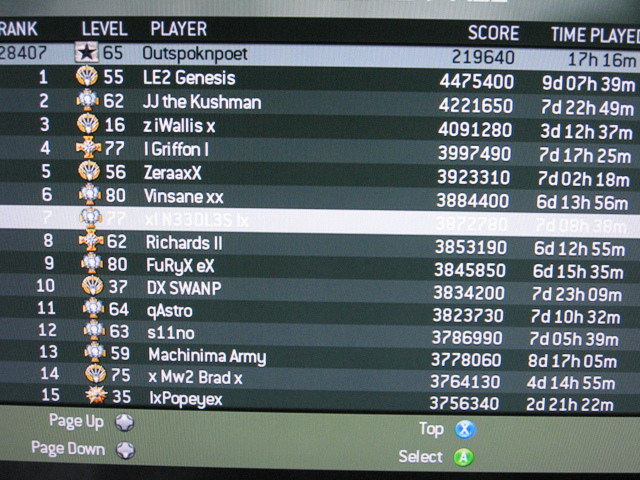 It has become an obsession for people to achieve some sort of status on these leaderboards. I have been hoping for years that there would be some sort of way to enjoy game without having someone in my match screaming about their KDR (Kill Death Ratio) or their Win/Loss Record. Again, I will be the first to admit that I hate losing and get frustrated when I have someone on my team that doesn’t know what they are doing. However, it is a different thing entirely for someone to put so much stock into their leaderboard rank that it supersedes everything else in life. I have heard stories about marriages ending because of obsessions with Madden, World of Warcraft, Halo and Call of Duty. I don’t think leaderboards are the only thing to blame for something to this extent but you can’t tell me that it isn’t there at all. While youtube and facebook have brought in a new era of non-privacy, leaderboards have brought a certain competitive stupidity to gaming that I think might do more harm than good. Author NoobTubeTVPosted on November 28, 2011 November 29, 2011 Categories Gaming Blogs, ReadingTags 360, Call of Duty, Modern Warfare 3, MW3, Noob, Noob Tube, Noobtube, Outspoknpoet, Xbox, Xbox 360, Youtube1 Comment on Have Leaderboards Destroyed Gaming? It is commonly known as the season of giving (or receiving if you are selfish). Either way it goes, gaming is one of those hobbies (lifestyles) that also ends up driving many gamers to punching their couch or throwing their controller during the gift season. You know who you are. You got Call of Duty, Madden, Battlefield, Assassins Creed, NBA 2K, Halo, the list goes on and on… and you are terribad. You aren’t just terrible. You aren’t just bad. You are terribad. (You: Because the game cheats!!!…. In case you haven’t noticed there are no more manuals in games. An extreme comparison is The Elder Scrolls IV: Oblivion Game of the Year Edition manual has 45 pages compared to the likes of Gears of War 3, Battlefield 3, Modern Warfare 3, Madden 12 and NCAA Football 12 which have a collective 15 pages! Here at NoobTubeTV our goal is to help you do those little things that game developers have decided they’d rather skip out on in paper format. While games now typically have ‘manuals’ digitally in the game, it is not the type of thing we support for people that don’t know that from the start. ‘Tis the season to kick developers in the digital face and learn how to play your new games.